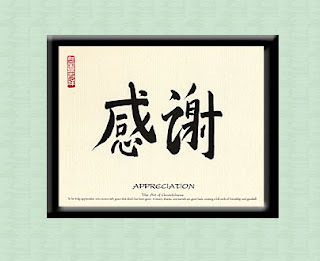 So what does appreciation have to do with the Law of Attraction and money? The answer is everything, if you attract experiences into your life as a result of the way you feel then feeling appreciative is one of the most gratifying emotions you could ever wish to experience. When you are appreciating you are basically being grateful for what you have, in other words by being appreciative you are being grateful for the things in your life which allow you to feel good. In order to attract the things you want you need to feel good so this means that appreciating is a very important key to getting what you want into your life. So how do you appreciate more. Well that is really simple, the thing most people find challenging is to actually maintain the state of appreciation. So let's begin getting you to appreciate more. I appreciate the people in my life, for their friendship, wisdom and love. I appreciate the car I drive that gets me to work safely and comfortably, and makes my life so much easier. I appreciate the money in my life that allows me to do some of the things I enjoy to do. Continue like this with your list of 6, once you have done this read the list and begin to get into the feeling place of feeling appreciation. Carry this exercise out for a few minutes until you really experience the feeling. Once you have this feeling get on with your day. Carry this exercise out 3 times a day and each day add to your list of things to appreciate. After a few weeks of doing this you will experience a dominant feeling of appreciation and gratefulness for so much in your life that you will then begin to attract more and more things in your life to appreciate which will include the things that you want to attract. This is one of the best and easiest ways to get the law of attraction and money working and flowing into your life. This article is written by Mike England. Article Source: http://EzineArticles.com/?expert=Mike_England. Yeah, we must always be grateful, it allows us to stay positive to move forward...thanks for dropping by have a wonderful weekend !! MKL, we can never live life to the fullest unless we can throw in gratitude as a way of life. That's the way I believe I should turn my life to. Hi Mee mOe, thanks for your support. Cheers! Be grateful for everything we have, while we still can. I am every day, Shingo T. We all should be. great post. gratitude is so important hen it comes to the law of attraction. start with being greatful for being ALIVE. And even though things may not be how you would like them to be, they won't improve if you are not greatful for what you do have. Read this Article, and use this as a guideline to show you how LOA actually works! Hope it helps! Thank you very much Ed. I will definitely read up on that article. Every tip and advice will be appreciated.